It started as a quest to visit all the 60+ BBQ places in the counties of Madison, Limestone, Morgan, and Lawrence in Northern Alabama (that is the Hunstville-Decatur Combined Statistical Area). Then I got sent back to Germany and there was no BBQ. But eventually I got assigned to a new job which takes me on business trips in the USA occasionally. So I reopened the blog – just deleted the “North Alabama” from the title. There is one philosophical question I am pondering now for quite a while - do dead flies on window sills contribute to the authenticity of a BBQ place? They certainly have a negative effect on overall cleanliness of a place, but is this merely disgusting or is it rather oozing a special southern charisma? Well, ultimately everyone has to decide for themselves where their threshold is when it comes to mummified insects in the general vicinity of their pulled pork. So, another Friday, another Gibson – you can’t swing a dead cat over your head without hittin’ a Gibson’s BBQ around here. This is the fourth different BBQ place I went to in the last few months that carries this identifier in its name. 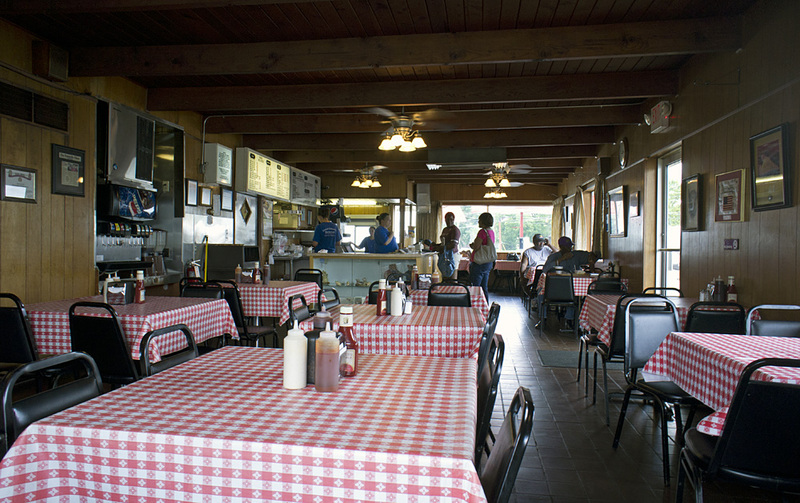 However, the good people at David Gibson Bar-B-Q in Huntsville make it abundantly clear to you on their menu card that they are not in any kind affiliated to all those other Gibson’s businesses around here, and that they only have this one location to serve us. But of course there is a family relationship to the aristocracy of North Alabamian BBQ. In 1939, Mr. and Mrs. David S. Gibson began their business with David’s father – the famous Big Bob – in Decatur. In 1956, they moved to Huntsville and in 1960 they opened the restaurant at the corner of Bob Wallace Avenue and Jordan Lane. Today, it is owned by their son. Not very much seems to have changed from those good ole times, judged by the dated furniture that shows clear signs of extensive use, by the sparse decoration of a few pictures on the wooden walls, and the worn out everything-else in this place. Up until now, I always thought that Styrofoam plates are at the lowest end of the plate pecking order. Not anymore. Disposable Styrofoam school-lunch trays have just taken that spot. You know, those compartmentalized yellowish rectangles with the embossed work MILK in one of the compartments and embossed slogans like DON’T DO DRUGS, or EAT YOU VEGGIES on one of the inner walls. Unbelievable. They are probably dirt cheap and yes, they fulfill the intended purpose, and they are certainly unique, but classy they ain’t. Any one part of all this alone would make the place just tacky and, figuring in the flies, also kind of yucky. All together however, this forms kind of an organic entity that oozes the genuine charm of unpretentious authenticity. So, to answer the question from above, I guess dead flies are a necessary part of the décor in those places. And don’t fret, since they are already dead none of them will hop into your pulled pork. Although, if they did they might be resurrected at the spot, because the meat is just divine. Very tender and succulent, with a very distinct hickory taste to it, it is to die for (sorry flies, for the disrespect). I had quite a bit of bark in my portion of pulled pork, too, which is of course the best part of the whole thing. As for the sauce, they keep it very simple – a vinegar based pepper sauce that is only mildly hot, a wonderfully creamy sour white sauce and ketchup. Here, I mixed a bit of the ketchup with lots of the mild pepper sauce and out came a very agreeable BBQ sauce. 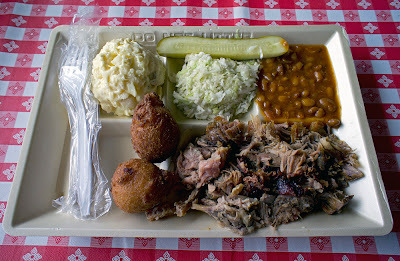 The white sauce on the other hand is just the perfect match for their hushpuppies, which you can have instead of rolls. The puppies are not sweet but well seasoned, and they taste great although being a bit on the compact side and not of the more fluffy kind. And then there is the potato salad, which has a mustardy sour and tangy taste to it – one of the best there is, really top notch. But this is all topped by the slaw. A hint of spiciness permeates the fresh cut pieces that are dipped in just enough vinegar to moisten the cabbage without drowning it in sourness. This is really the most outstanding slaw I had so far. Oh, they also give you baked beans with the meal. Those are okay. 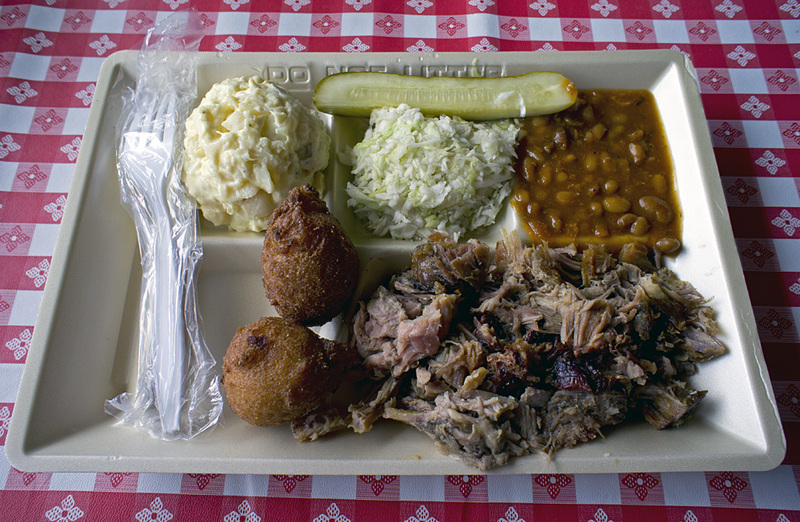 But the slaw … and the meat … utterly delightful. Also very positive are the civil prices – for a large and a small pork plate, each with a drink, we paid under twenty-two Dollars. The amount of food, though, is a bit disproportional. My large pork plate, which was three Dollars more, had distinctively more meat on it than the regular pork plate my wife had. But since she had the better view at the dead flies on the window sill, I guess we’re even. First and foremost, its about the food. And although it is certainly a very prominent factor, the quality of the meat is only part of the equation. The sides, the sauces, the hushpuppies (what do you mean, your place doesn't serve hushpuppies ...?! ), and the desserts are also very important. Then there is the question of authenticity and style. Part of every dining experience is the atmosphere of the place you eat the meal, meaning that not only the taste-buds have to be pleased, but also the other senses, too. Living in the South for quite some time now made me realize that the human body and mind can process a lot more dirt and filth without being harmed then commonly expected, so cleanliness is certainly a virtue, but not a strict requirement. At some places, the mummified flies on the window sills just belong there. An absolute must is friendly people who make you feel welcome at their restaurant. But that is generally not an issue here in the BBQ Belt at all, for all the rude and brisk folks very seldom seem to cross the Mason-Dixon line. So, I guess what I am looking for in a BBQ place is what you generally find here anyway. And if your favorite restaurant does not appear on the Dirty Dozen list below, don't fret. This is only my very narrow personal view of things, and your mileage will invariably be different. 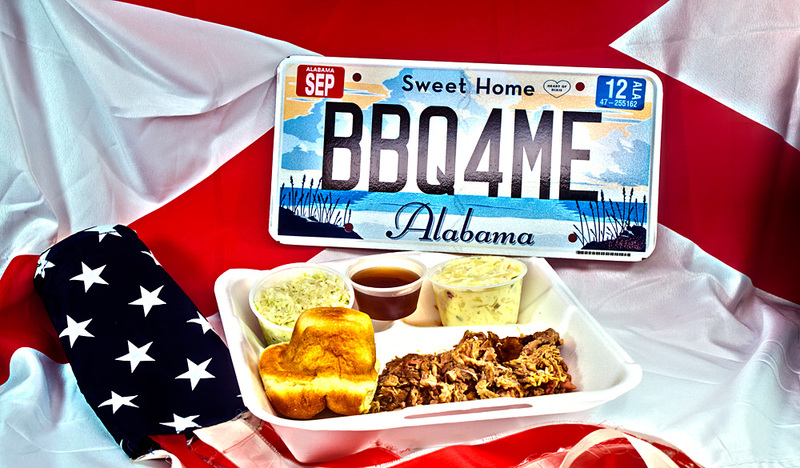 Just be thankful to live in the promised land of BBQ, and keep on going to the places you like best. Don't mind me at all, I do not have the philosopher's stone in my possession, just a knack for BBQ and Southern culture.